These days a parent could offer their young child storytime with a picture book as well as by playing an audiobook or with an animated film or just go on YouTube for all sorts of short clips! Although the explosion of screen-based media has transformed the experience of childhood, from TV and videos, to an unlimited range of technology available at any time via mobile devices, scientifically it’s been shown books are still the best way to open children’s mind to a new world. 7th of March 2019 was World Book Day in the U.K. Books are great resources for bringing excitement into our lives and learn new things through stories. Children who read books have a better understanding of the world around them and can have more imagination. Enjoyment of shared reading between parents and children is also immense. As children across the UK were thinking about Matilda and Harry Potter to celebrate World Book Day at schools and nurseries, we like to talk about swimming books. Books and specially picture books about swimming can generate excitement about learning to swim and going to swimming pools and that can make a big difference when young children want to start their swimming journey. Through reading books, children learn about people, places, and events outside of their own experience and one of the best ways for introducing your child to swimming is through stories. Parents can do use bedtime in advance of going to swimming pools and starting lessons to prepare their kids for what they should expect. Here is a list of four nice swimming books that you can easily buy or borrow from your local library and toddlers and pre-schoolers will find them a joy to read with you. Here’s a cute story about ‘Peppa Pig’ who goes to the swimming pool with her parents and her younger brother (George). During the story, young children can learn about a family swim, visiting a swimming pool, armbands. Daddy pig and mummy pig are encouraging parents in this book so, Peppa and George get plenty of encouragements for them for getting in the swimming pool. 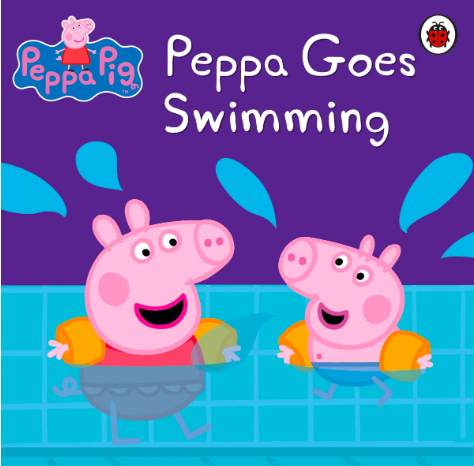 In this story, Peppa also swims with her friend and finds out how much fun swimming with friends can be. 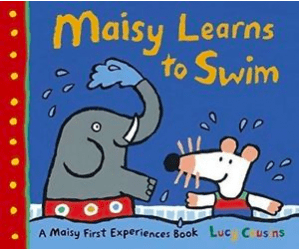 This book is about the famous Maisy being nervous about her first swimming lesson. From changing room to the swimming pool, children will learn how they look like. It is also a nice story to prepare your child for the first swimming lesson. Eddie and Tallulah-who are Maisy’s friends-have come along and they all have swimming lessons which turns out to be a good fun. A great swimming teacher of this story is teaching Maisy a lot of things, including floating like a starfish, kicking and blowing bubbles. Going to the swimming pool for the first time for Topsy and Tim is far from daunting. 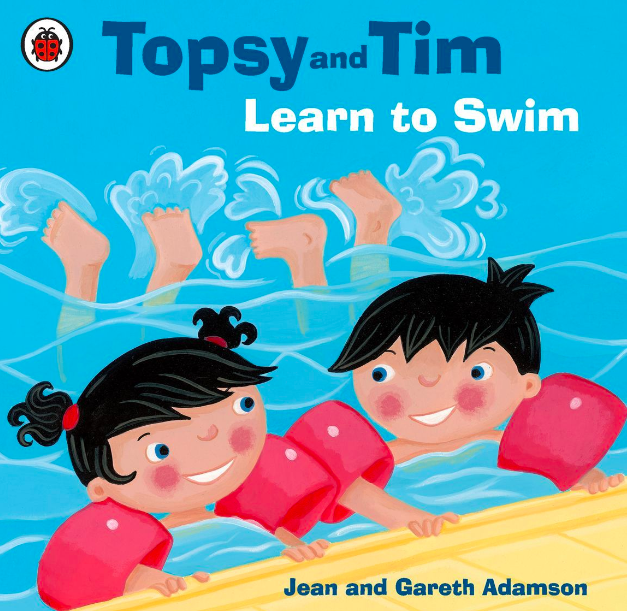 In this story, Topsy and Tim meet a nice swimming teacher, learn how to swim without their armbands and take part in a swimming competition for beginners. A cute story which warms children, specially pre-schoolers, towards learning to swim. You can listen to Miranda Gore Browne here reading this book. It is a fantastic sensory book and highly recommended for babies and toddlers. 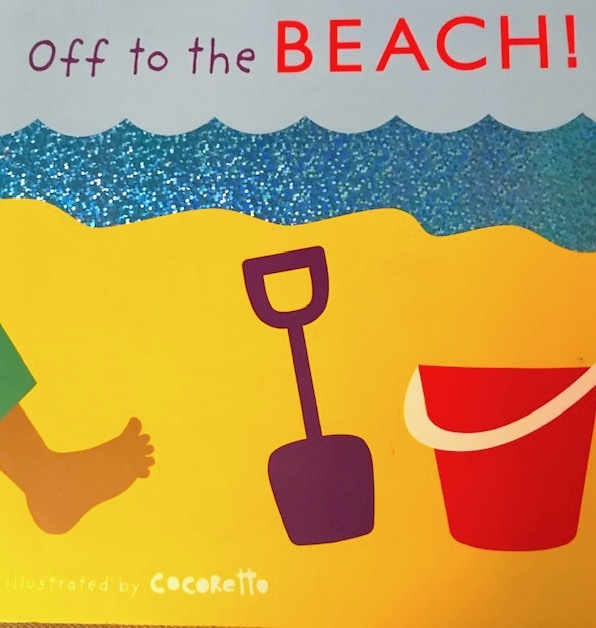 If you want to show your little ones what can be done on the beach or what they could find on a beach, this book has plenty to offer. You can have fun using your senses in this exciting and interactive visit to the beach! A journey of discovery designed with young children in mind. Summer and swimming season is approaching fast, so, you can use this book to prepare your toddler for your upcoming beach holiday. All of these books can help parents explore the wider world with their children, talk about feelings and emotions associated with swimming and leraning to swim, and build the relevant vocabulary through every book.